Heyo, I forgot to post yesterday! Here we are! I love myself some sarcastic and heroic Percy Jackson sass. Percy, like Jason in the first book, wakes up in the wrong place and doesn’t remember who he is. The only thing he remembers is Annabeth. He loves her and has to get back to her. Enter Hazel and Frank, two centurions from a mysterious town of Roman demigods. It’s like Camp Half-blood, but you can grow up there and live a life into adulthood, go to university, raise a family, and Percy is thinking this is a great plan even though he knows he isn’t meant to be there. A Prophecy of Seven was made about seven demi-gods having to stop Gaea from rising. Her giant sons were just the start of their troubles. I really liked this one, not just because I got to see Percy again, but because for some reason, I really like Frank. He’s a giant Chinese baby-faced kid who is clumsy and a bit of an oaf and says the wrong things and acts the wrong way and then he just blows up and becomes a badass. He reminds me of Neville Longbottom. Great second addition to this series. 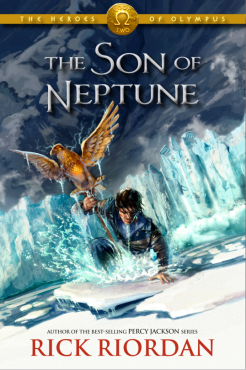 Allison Abate • This entry was posted in Teen and tagged frank, goddesses, gods, greek, hazel, hero, heroes of olympus, juno, jupiter, Percy Jackson, poseidon, roman, teen, The Lost Hero, The Son of Neptune, young adult, zues. Bookmark the permalink.